There are many recreational activities that help put a little excitement in your life. Those that want to venture off-road and escape traffic congestion might do well with mountain biking. And for this, you need a good mountain bike that shows you know what you’re doing. There are numerous variations within the mountain bike category classified in terms of suspension, frame geometry and wheel size. For instance, you’ll get a full suspension bike, hardtail bike (front suspension) or a rigid bike that lacks suspension. So before rushing into take a ride of your dream, you need to sit down and consider your options. That means going for a mountain bike that matches your size, comfort, safety and the type of terrain you’re planning to ride on. Just for a tip, those looking for an all-round riding on roads and trails will go good with a rigid mountain bike. Front suspension and full-suspension bikes make a perfect choice for rougher terrain and the more technical tracks respectively. Want to get one for yourself? Here’s a list of the best mountain bikes that will give you something new to try out. This is a hardtail mountain bike that comes a tad lighter compared to the full suspension units. It’s lightweight construction and stiffness make it an ideal choice for the less challenging trails. The frame is made of steel, a feature that makes this bike a good option for entry-level riders. There are 12 gears sporting an enormous cassette that equals the performance of 2x drivetrain. The bike makes use of light and nimble 26-inch wheels and a linear pull brake system. The hybrid suspension sported in this mountain bike provides an improved hardtail design for maximum comfort. This hybrid suspension provides a great ride in cross-country racing. The frame is made of steel; a slightly heavier construction that adds more stability to the bike. Good traction and extra stability is provided by 26-inch full back tires measuring 1.95 inches wide. Entry-level riders might find this bike quite a worthy choice. Get awesome comfort and better control in rugged trails with this full suspension bike. This is a great sport bike that provides sweet parts at a sweet price. The frame is made of aluminum to provide a light and stiff construction designed for greater power transfer. The bike is fitted with disc brakes that last longer and hold up well in muddy and wet conditions. It makes use of SRAM shifters that give you an easier time changing gears. Large 29-inch tires roll better over obstacles and provide additional traction. This mountain bike is a cost-effective choice for those looking for performance. 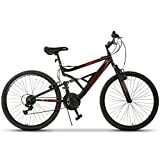 This is an all-round hardtail mountain bike specially suited for recreational riders. The frame comes strong in a steel construction yet manages to keep the weight down. The bike rolls on standard 26-inch tires and sports a 3-piece crank designed to provide a wide gear range for varying terrain. 18-speed SRAM twist shifters make gear changes a lot more smoother. The bike has linear pull brakes that provide a stopping power you can rely on. This is a perfect two-wheel companion for women. It’s an entry-level mountain bike that’s equally at home on paved surfaces as it is on off-road trails. This hardtail sports a 75mm suspension to add more comfort to the ride. The saddle comes plushy and well cushioned; a perfect comfort for ladies. Shimano twist shifters come in handy to ensure that you’re always in the right gear every time. This bike sports the extra strength and lightweight construction of butted aluminum frame. It has 27.5-inch tires and is available in four different size options. This is a woman’s bike; one that combines style and performance to give you a ride that’s one of a kind. You get an impressive performance at an affordable price that’s the cheapest on the list. 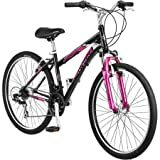 The bike comes in a hardtail design to let you enjoy a ride on paved surfaces or on dirt roads. It has the toughness of a steel frame with a lightweight construction that’s easier on women. 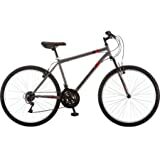 The bike is equipped with 21-speed Shimano shifters and comes with standard 26-inch tires that hold up well on the road. Built with quality and comfort in mind, this hardtailer adds more fun to every ride both on light dirt trails and paved surfaces. The bike provides the benefits of an upright aluminum frame, which provides a comfortable riding position that saves you from neck and lower back fatigue. Impressive 21-speed Shimano shifters tackle whatever comes in your path without having to take your hands off the grips. 27.5-inch tires measuring 2 inches wide give you more confidence to tackle bumps and other obstacles. The bike is equipped with linear pull brakes and is a good option for entry-level riders. This mountain bike has a stylish design specially meant for women. The bike is a hardtail that handles rough and uneven terrain. The frame comes in steel and you get a quick-release saddle that adjusts to different heights. This bike provides a good ride on both hilly and downhill trails, thanks to its 21-speed Shimano gear shifters. The bike has standard 26-inch tires and gets its stopping power from linear pull brakes. Tackle the toughest ravines and steepest hills with this full-suspension mountain bike. The aluminum frame makes it lightweight and stiff enough to handle whatever is thrown at it. A dual-suspension mechanism comes in handy to absorb any bumps or ruts you encounter. This bike is equipped with 24-speed Shimano shifters for smooth gear changes even on the steepest terrains. It has two brake systems: front disc brake and rear linear pull brake. This bike is fitted with standard 26-inch tires.